Police fired rubber bullets and tear gas at a right-wing march. POLICE HAVE FIRED rubber bullets and tear gas at a right-wing march that took place in Warsaw as Poland marked its independence day. Police spokesman Mariusz Sokolowski says two officers were injured and that several hooligans were detained after throwing stones and metal objects at the police. 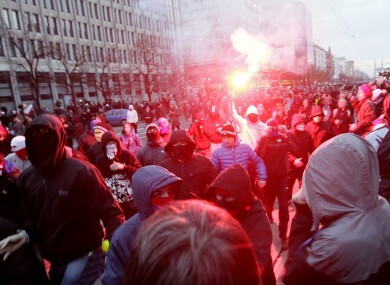 The right-wing hooligans disturbed just one of the many marches taking place in the capital on Sunday to mark 94 years since Poland regained sovereignty after more than 120 years of imposed foreign rule. In a march led by President Bronislaw Komorowski, thousands of people walked peacefully. During last year’s observances, many police officers were injured and there was damage in the streets when right-wing marchers clashed with opponents and police. Email “Violence reported as Poland marks its independence day”. Feedback on “Violence reported as Poland marks its independence day”.